Gennady Sharoikin was born in 1959. Graduated from the Ekaterinburg Shadra Art College in 1984. Currently lives and works in Ekaterinburg (Russia). Preferences: easel painting (landscapes and genre paintings) and graphics. He works in styles of realism and surrealism. Participated in more than 30 exhibitions in Russia, Italy. His works are presented in corporative and private collections in Russia, Europe, USA. 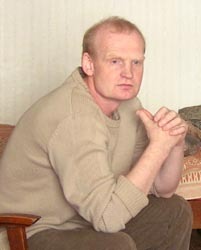 He is a member of the painters union “The Surikova,31”.